GALKAYO, Somalia Sept 27, 2014 (Garowe Online)-Aviation authorities in Mudug regional capital of Galkayo of central Somalia say operations have returned to normalcy after a two-day shutdown due to security reasons, Garowe Online reports. At least four flights are said to have arrived at Abdullahi yusuf airport and departed for their respective destinations on Saturday, with Puntland Government officials including Security Minister Hassan Osman Allore and Mudug Governor Mohamed Yusuf Jama Tigey touring the airport. 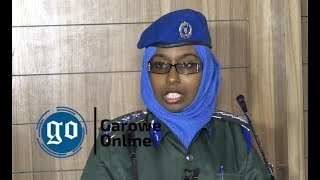 The Deputy Mayor of Galkayo Yacqub Mohamed Abdalle told GO that Puntland security forces are in charge of full control of the airport. “I confirm to you that fourth flight has departed Abdullahi Yusuf airport a few moments ago. 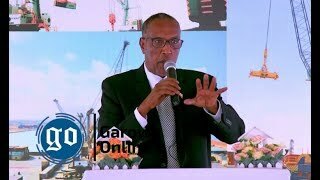 It is secure one hundred percent and we will shoulder the security of residents of south Mudug while departing and arriving at the airport,” said Abdalle. 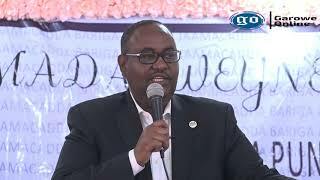 Puntland’s Minister of Civil Aviation and airports Hassan Haji Saed who held a news conference unveiled that normal operations are underway and expressed hope about the situation. 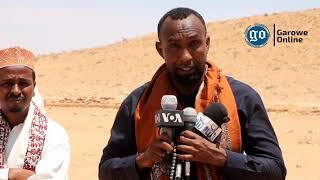 Galmudug leader Abdi Hassan Awale Qaybdiid threatened with strict action against landing passenger planes while addressing hundreds in Barahley neighborhood. Meanwhile, federal Government of Somalia’s Prime Minister Abdiweli Sheikh Ahmed Mohamed has called on both Puntland and Galmudug to put an end to Galkayo airport standoff. 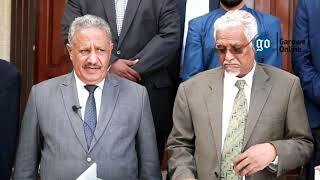 In a press statement released to the media, PM Mohamed stressed the need for peaceful solution to the dispute and pledged negotiation platform for the two sides.